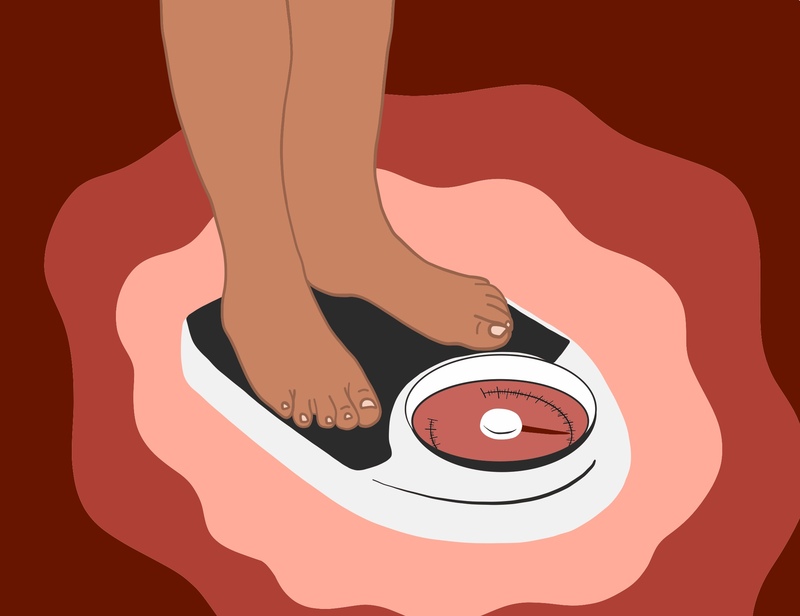 Stepping on a scale can only tell you so much about your health, so maybe you have turned to the universally-accepted body mass index (BMI) for more insight. But BMI is debatable in its own right. In fact, a 2016 study found that for many people, your BMI doesn’t actually reveal whether or not your body is healthy and functioning at its peak. To get the facts on BMI, HelloGiggles spoke to registered dietitian-nutritionist Sonya Angelone, who’s a spokesperson for the Academy of Nutrition and Dietetics. We asked her if BMI is a myth, and she told us that while it’s helpful in some ways, it’s far from the be-all-end-all of health. BMI is a person’s weight in kilograms divided by their height in meters squared, and its origins date all the way back to the 1800s. As the paper “The Average Man and Indices of Obesity” outlines, Belgian mathematician, astronomer, and statistician Adolphe Quetelet created the equation in 1832 in his quest to identify the body of a “normal man.” It was known as the Quetelet Index until American physiologist Ancel Keys called it the “body mass index” in 1972. Keys’ research seemed to prove that Quetelet’s equation was valid, and since then, BMI has been widely used to associate weight with potential health risks and mortality rates. To find your own BMI, you can enter your weight in pounds and height in feet and inches into a BMI calculator. If the sum is under 18.5, you’re considered underweight; between 18.5 and 24.9, normal weight; between 25 and 29.9, overweight; and 30 or over, obese. As Angelone explained, the point of the BMI is not about aesthetics or to shame you. Instead, the ranges are looking at your risk of disease. Yet, while Angelone called BMI a “useful tool,” she noted it has many limitations—especially since it’s best applied to groups of people to find population trends. Your body mass index, or BMI, is a ratio of your weight to height and is used as an indicator of body fat. Another downside of BMI is that weight is a major component of it. “What’s really important for somebody’s weight is to know the quality of that weight. Is it fat or muscle? And BMI doesn’t really tell you that,” Angelone said. “It doesn’t differentiate between muscle mass and fat mass.” When it comes to being healthy, “The goal is to have more muscle in general,” Angelone said. Based on your muscle mass, a BMI in the normal range may not be optimal for you. For example, Angelone noted that BMI is misleading when it comes to athletes. An athlete in prime health with a lot of muscle mass could have an overweight or obese BMI. But their BMI is high because of the weight of their muscle, not the weight of their fat. On the flip side, a person who does not have a lot of muscle may have a normal BMI, but that doesn’t necessarily mean they are healthy—their body could primarily be made up of fat. Other groups that may not be accurately represented by the BMI scale are people who have bigger frames and smaller frames. Some Asian countries also use different BMI ranges. “The Average Man and Indices of Obesity” reported that BMI data was mostly taken from Anglo-Saxon populations, so it wasn’t until the early 2000s that researchers discovered the scale wasn’t accurately measuring the health of Asian populations. The World Health Organization (WHO) reviewed the evidence and saw a trend where people in certain Asian countries who had normal BMIs still had a high risk of type 2 diabetes and cardiovascular diseases. This is an example of how BMI can fail an individual—and even a whole population—by not accurately gauging potential health risks. Angelone doesn’t believe a skilled clinician should need to rely on BMI to assess an individual’s disease risk. But how about measuring your own health? How can you do that yourself? Angelone told HG that body-fat measuring can give you a better idea of how much of your body is fat and how much is muscle, but the processes to get that information have their own complications. There’s body-fat measuring in a tank, which Angelone said most people understandably don’t have access to. So the more common way is skin-fat measurements with calipers, also known as skinfold measurements. “The problem is is that you have to have somebody who really knows how to use calipers,” Angelone said. She also recommended that if you are monitoring your skin fat over a period of time, you have the same person measure you each time. Instead of BMI or body-fat measurements, Angelone recommended using waist measurements to help track your health. There’s waist circumference, waist-to-hip ratio, and waist-to-height ratio. For waist circumference, you simply measure your natural waist. Your natural waist is the narrowest part of your torso that usually falls right around or above your belly button. (You can also lean to the side and where you bend is your natural waistline.) The National Institutes of Health (NIH) states that women are at higher risk for heart disease and type 2 diabetes if their waists measure greater than 35 inches (for men, it’s 40 inches). A guide from the NIH explains that research has found that people have a “higher risk of diabetes, dyslipidemia, hypertension, and cardiovascular disease because of excess abdominal fat.” That 35-inch number comes from a study published by Circulation that looked at the Nurses’ Health Study. More than 40,000 women were followed for 16 years and researchers found that women with larger waists had a higher risk of dying from cardiovascular disease (CVD) and cancer than women with smaller waists. “Elevated waist circumference was associated with significantly increased CVD mortality even among normal-weight women,” the study notes. To find your own waist circumference, you simply need a tape measure and, as Angelone noted, make sure you aren’t pulling it too tight to get an accurate reading. For waist-to-height ratio, or WHtR, measure your waist circumference divided by your height. A U.K. study proposed that you should “keep your waist circumference to less than half your height,” so the ratio should be less than .5. But Penn State PRO Wellness lists WHtR ranges for women thusly: less than .42 is underweight; .42 to .48 is healthy weight; .49 to .57 is overweight; and .58 or over is obese. Angelone stated that she thinks waist-to-hip ratio is the best, but either WHR or WHtR paints a more accurate picture of your health than BMI. She also noted that studies have shown that these waist ratios are stronger indicators of potential health risks, like heart attack and stroke. A 2009 study found that WHR, WHtR, and waist circumference were all better than BMI in predicting coronary heart disease in women. Abdominal fat is associated with increased heart disease risk. A waist circumference over 35" for women and 40" for men may put you at risk. As for the dreaded scale that helps you figure out your BMI, Angelone said there are some positives to knowing where you fall weight-wise. It’s easier to maintain a healthy weight than to lose weight, so weighing yourself can help you see fluctuations. When it comes to your BMI and weight, Angelone noted there are genetics, people’s relationship to food, and other factors to consider. So the bottom line is that your health isn’t “just a simple mathematical equation,” which, depending on your circumstances, may mean you can say goodbye to that bothersome BMI.